This content first appeared in Sport Review newsletter number eleven – if you’d like to receive articles like this and much more every Friday, you can sign up here. Auckland’s stadiums are like Stuff commenters – there are too many of them, and they’ve all got something wrong with them. This week’s Auckland venue development strategy, handily summarised at sportsfreak.co.nz, confirmed that as ever, the sticking points are Eden Park, Mount Smart and Albany Stadium. There’s an argument for knocking at least two out of three over and starting again. What’s it good for? Rugby, and history. It was fantastic for RWC 2011, but that relied on temporary seating being put in. The number two ground is lovely for second tier cricket, with the old stand and the service station over Sandringham Road to aim at. What’s wrong with it: It’s basically the world’s largest Back Yard Cricket venue, and no-one turns up for Test matches despite best efforts to put on a show. It’s too far out of town and your transport options are highly variable. Residents permanently terrified of Otago students vomiting on the Q7. No concerts allowed. Personal high point: Cricket World Cup 2015 v Australia and the semi final, Waikato winning the Ranfurly Shield in 1993. What’s it good for? Has potential but needs lots of work. Why not embrace the Shore’s culture and make it Stadium South Africa, home base for visiting Super Rugby teams, with Braai? What’s wrong with it: Frustratingly far away from the bus station. Could be an ideal NZ Football venue and high performance set up but needs to get a pro team of its own, which is a can of worms bigger than Dune. Personal high point: I saw the Kingz there once. What’s it good for? Spiritual home of the Warriors, in spite of itself. Close-ish to public transport if you’re up for a bit of a walk or are into industrial areas. What’s wrong with it: Tired, needs a lot of fixing up. Despite having roots in South Auckland, the owners are keen as beans to move into town. Where Carlaw Park was. Ahem. Personal high point: Paul McCartney last year, Big Day Out ’94. What’s it good for? Drinking beer beside the Waitemata water while watching yachts. Simple pleasures. It’s right beside the Viaduct where it all started, and takes advantage of all the development since. What’s wrong with it? Nothing so far – there’s a lot to do, but it’s going to be in Auckland, not Italy, which is a great start. Personal high point: When we retain it. What’s it good for? It’s downtown, still pretty modern and great for netball, basketball and concerts. What’s wrong with it? The trains go straight past it, meaning an awkward walk back from Britomart. Would be the ideal location for a waterfront stadium. Personal high point: Luckily, courtside for the Breakers one time, Pixies Dolittle tour in ’10. What’s it good for? The boutique ground to rule them all. OK, it doesn’t technically exist, but if we can build a venue that can handle 5 or 45k fans just as easily, with lights, green top pitch, craft beer and some kind of artisan meat snacks that can still handle big summer concerts, it’s going to be an absolute winner. Victoria Park would be even better but it’s hard to see this flying. What’s wrong with it: Residents permanently terrified of Guns n Roses showing up in speedway cars to poo on their begonias. Personal high point: U2’s Love Comes To Town show in 1989, it was ace. sportreview.net.nz was lucky enough to contribute to top website The Spinoff, plumping for Kane Williamson as our greatest ever batsman, despite him only being mid-career. Have a read. Then, come back and watch this video of Kane in the IPL – I love seeing what he can do in games like this, when he’s given a bit more license to improvise. With arguably less pressure on him, he can be as inventive and outlandish as anyone. And as always, matching his approach to what’s required for his team. Everyone’s favourite angry gnome is sick of just playing cricket and that, and is once more focused on verbals and being held back from fights he’d definitely win. His encounter with de Kock has had more close examination of camera angles than the JFK assassination, with none of them showing much that you’d write home about. Any more discipline demerit points for Warner in the next couple of years will draw a suspension, and free him up to spend more time with his family he’s gotten so angry defending. In fairness, his coach and CEO seem pretty relaxed about losing their world class opening bat for brain-explosion reasons. Maybe the board should have a view. 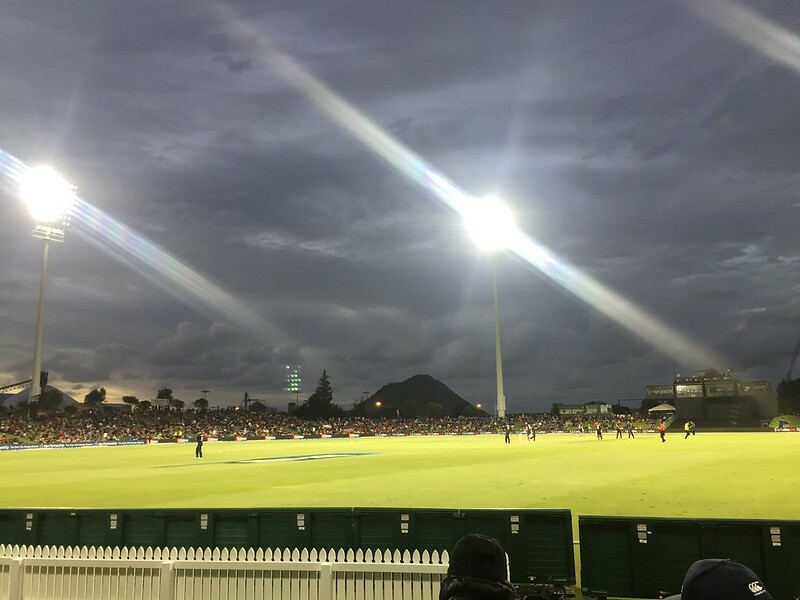 ‘It’s great these lights are *finally* up,’ said Neil Craig, NZC board member and a driving force behind developing Bay Oval, while being interviewed on the big screen mid way through England’s innings. The ‘finally’ indicates the ambition for this ground. Competition is getting fierce among the new breed of boutique grounds that includes University Oval, Hagley Park and Saxton Oval (not to mention Queenstown, Whangarei, New Plymouth and arguably the Basin, now it’s been opened up to white ball cricket). 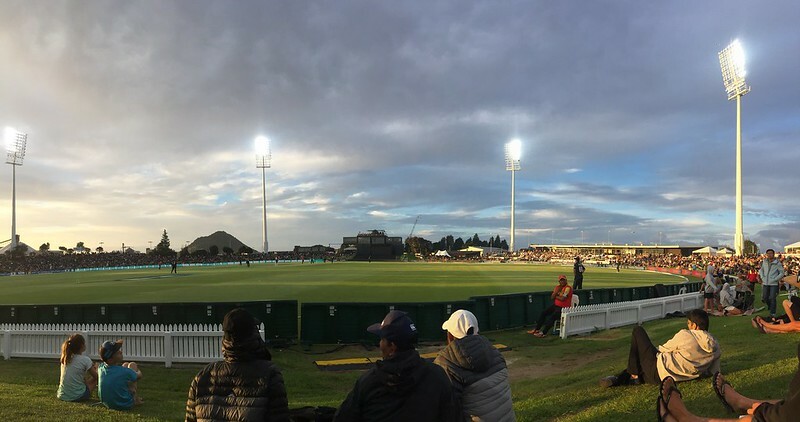 But the Bay’s oval has moved fastest to get those all-important lights, and was rewarded with the popular holiday period T20s, along with Napier’s only scheduled international game thrown in. It’s not hard to see more ODIs against the big guns coming here after 8000 or so punters packed in on a Wednesday night, and day / night Tests were mentioned more than once in conversations on the grass banks. It’s an easy ground for punters to get around and find a spot that suits on the banks, and the food on offer is top class, including sportreview.net.nz-endorsed Tag Burger. The Mount looks bloody fantastic on SKY’s drone shots too. I’m certain the building won’t stop there either, this ground has built up a serious head of steam. A new stand next? 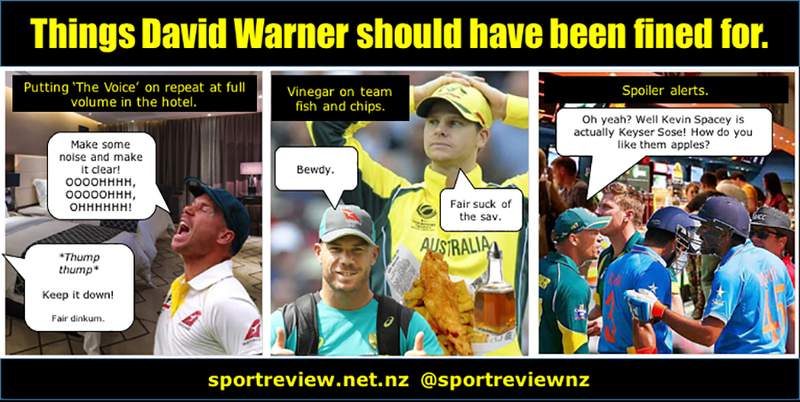 As for the cricket, it was pretty enjoyable. For England. They fielded like the Kray Twins chasing down a debt, and their batsmen did to us what Ross Taylor and Tom Latham did to them in Hamilton, finding gaps and play it risk-free. It was classy stuff, and this series looks like a tough assignment for both teams, and an intriguing one for the fans. Ben Stokes has gone from Andy Caddick to Russell Crowe quite quickly hey. Mascots are generally soul-less husks, but the New York Mets’ Mr Met brings a raw honesty to his work. He’s been fired, of course. Long, raw and fascinating interview with Mark Butcher on his bizzaro life as an international cricketer. The ‘few beers in a pub garden’ interviewing style here really works. SIGNAL from Revel Co. on Vimeo. Nothing worse than social media criticism – but consider England, responsible for cricket’s existence, being mocked by the game’s governing body with a GIF featuring a reality TV (presumably) unknown. Cheap effort for clicks from a digital team who’re otherwise kicking arse at making footage and exclusives available online fast. Brown’s Bay’s Freyberg Park, basically Lord’s with knee deep grass. 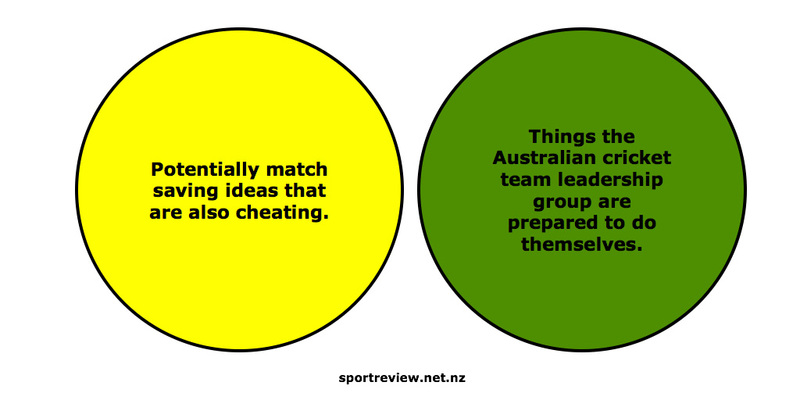 As average cricketers go, I’m pretty much middle of the pack. After playing through school, club cricket at Uni and a magical Guinness-soaked season in Ireland I haven’t bothered an oval in any fashion until late 2015, when I’ve had the honour of representing the mighty Mairangi Vice in East Coast Bays cricket club’s Bays Big Bash comp. It’s an eight a side Twenty20 comp designed for chaps who’ve played a bit in the past but are too hectic with kids / jobs / laziness to play at the weekends, and are also probably mostly injured. There’s a few rules designed to get the game done before dark like short run ups and only bowling from one end – it felt good to be playing with a proper ball again. Our team was made up of Dads from around the neighbourhood and around the world, with South Africa, England and India as well as NZ represented, we were a happy unit. Most Monday nights I’d drift off to sleep replaying the one that really came out of the middle of the bat with a satisfyingly wooden-sounding Tchock. Or feeling more useless than Darren Lehmann’s thesaurus because I’d dropped another catch. Either way, playing again has been bloody magic. Trade Me definitely enabled the excitement before season one. I needed a new bat and won the auction for a Slazenger V900 bow, a nice piece of willow that was definitely wider with bigger edges than the ones I was used to back in the day. I was a bit devastated to see Michael Clarke’s name on the back of it, and even more so when I scored a new bag, which also turned out to be endorsed by my least favourite cricketer ever. That will learn me and I look forward to getting my Shane Watson pads next year. My Michael Clarke bat, Michael Clarke bag, his reaction at my kit. I consider myself mainly a bowler, yer medium pace out swing, off cutter, obvious slow balls kind of carry on, but my memories didn’t really match up with what my arm refused to do any more. We were playing with white balls that swung alarmingly for the first four overs, then immediately transformed into pieces of dry soap, and it took me some time to get into a decent rhythm and get those effort-ball-leg-side wides out of my game. A few wickets came but I was never the game changer I envisaged on the drive to the ground. Batsman’s game, innit. In game one this year, full of confidence after a hasty net the day before I somehow managed to rattle up 65 not out. In my mind it was Guptill at the cake tin. The reality was probably more paddle crab with bat. You can always tell what kind of backyard a batsman has from his go-to shots. For me, the target areas were straight down the ground to the back fence, slashing between point and the covers into the large shrubs and nothing on the leg side, where the windows were. I did manage to work a kind of golf shot to cow corner into this limited set of shots and somehow managed another three 50s this year to my utter delight and furious eye rolling of my partner and kids. The real shocker was in the field, I could not take a catch to save my life. Everything went great in practice but get me out there with a real live chance and I went to pieces, mournfully throwing the ball back, apologising to the bowler and muttering all the swear words I know to myself for the next few overs. I have no excuse, and if I get to play again, I’ll be out there doing proper practice pre-season. Hopefully. Full credit goes to the umpires who put up with us, Louis at East Coast Bays and the Mairangi Vice fellas themselves for their enthusiasm and reliability. I’m sure I’ve done something to my shoulder, and while I’m busy not doing anything about it during the winter I’ll have those happy memories of a straight half-volley sailing over the boundary or actually getting a yorker right for once. It’s been amazing fun.